Ahwatukee Haunted House and Hayride is a Haunted Attraction located in Phoenix, AZ. 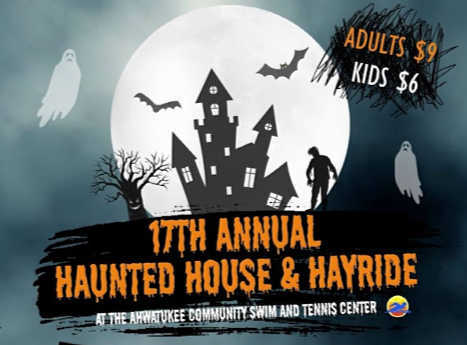 Join us if you dare for the Ahwatukee Community Swim & Tennis Center’s Annual Haunted House & Hayride! The abandoned asylum, scary zombies, haunted fields and creepy doll house are sure to make you jump! For those who frighten easily, there will be a not-so-scary time. Each year, 80+ high school volunteers work very hard to bring the community an innovative and creative Halloween experience. They strive to keep the scares down to a minimum for the younger crowd and enjoy scaring the ones who want the full adrenaline pumping experience! Come and enjoy this one of a kind, outdoor spooky adventure!